The Youngstown State football team faces another challenging road test as it travels to Jacksonville, Ala., to take on Jacksonville State in the second round of 2016 FCS Playoffs. Kickoff for the contest at Burgess-Snow Field at JSU Stadium is set for 2 p.m. Eastern/1 p.m. Central time. The game is available on WKBN 570 AM, iHeartRadio and ESPN3/WatchESPN App. YSU (9-3) won its first playoff game since 2006 beating Samford from the Southern Conference 38-24 last Saturday at Stambaugh Stadium. The contest was tied at seven late in the second quarter before the Penguins scored 31 of the game's next 34 points to lead 38-10 in the fourth quarter. The Penguins led 7-0 following a one-yard touchdown run by Shane Kuhn before the Bulldogs tied the game late in the first quarter. Zak Kennedy kicked a 25-yard field goal late in the second quarter as YSU led 10-7 at halftime. In the third quarter, Tevin McCaster and Martin Ruiz scored on one-yard plunges as YSU led 24-7. Jody Webb added a pair of touchdown runs in the fourth (62 yards and six yards) to put YSU ahead 38-10. Samford had two touchdowns in the final seven minutes for the final margin. The Penguins had 289 yards rushing and five touchdowns as Webb led the way with 174 yards on 27 carries and two scores. JSU (10-1), the third-seed in the playoff bracket, has won nine straight overall and 14 in a row at home with the last loss at Burgess-Snow Field at JSU Stadium coming in December 2014. The lone loss this year for the Gamecocks came at LSU (34-13). Last year, JSU advanced to the FCS Championship Game falling to North Dakota State 37-10. The Ohio Valley Conference champions are led by Walter Payton Award finalist QB Eli Jenkins. The trip to Alabama marks the first in program history for the Penguins. YSU is playing a member of the Ohio Valley Conference for the third time in the FCS postseason. The Guins won two previous meetings with Eastern Kentucky (1989 and 1994) by a total of seven points. The Guins are appearing in the FCS playoffs for the 12th time in the program's history. YSU won national championships in 1991, 1993, 1994 and 1997 and owns an all-time mark of 26-7 in the FCS/Division I-AA Playoffs. In FCS playoff road games YSU is 8-5 but has dropped its two most recent road contests (Appalachian State in 2006 and Richmond in 2000). The Penguins' last playoff road victory came at Montana in 1999. • YSU had five players named first-team All-Missouri Valley Football Conference, its most since 2006. • The Penguins are one sack shy of the school record of 44 set in 1982. YSU has registered 43 sacks this season in 12 games. • The last eight touchdowns scored by the offense are rushing scores. Twelve of the last 13 scores are via the rush as well. • TB Martin Ruiz is just 89 yards shy of Jamaine Cook's school mark of 5,220 all-purpose yards. • In his last three games, TB Jody Webb has rushed for 507 yards on 63 carries and scored four touchdowns. • For the sixth time in his career - and third straight game - Webb amassed more than 200 all-purpose yards in a game. Webb had 276 against Samford, including a career-best 174 yards rushing. • QB Hunter Wells has completed 22 of his last 27 passing attempts. • YSU's last win over a top-five ranked team on the road was at No. 1 NDSU in 2011. • YSU has not allowed a rushing touchdown in the second or fourth quarters this season. • The Penguins had three sacks against the Bulldogs. YSU has had three-or-more sacks in a game eight times this season. • Redshirt freshman P Mark Schuler had a 74-yard punt in the first quarter. It was the third-longest punt in school history and YSU playoff record. • YSU has scored 103 points in the past two games. In the previous seven contests, YSU scored 111 points (with a high of 30). • Including Jacksonville State, YSU's six road opponents this year are a combined 47-20. Three are seeded in the top eight in the FCS Playoffs and the other 9-2 West Virginia. YSU won its first playoff game since 2006 beating Samford 38-24 at Stambaugh Stadium. The contest was tied at seven late in the second quarter before the Penguins scored 31 of the game's next 34 points to lead 38-10 in the fourth quarter. The Penguins led 7-0 following a one-yard touchdown run by Shane Kuhn before the Bulldogs tied the game late in the first quarter. Zak Kennedy kicked a 25-yard field goal late in the second quarter as YSU led 10-7 at halftime. In the third quarter, Tevin McCaster and Martin Ruiz each scored on one-yard plunges as YSU led 24-7. Jody Webb added a pair of touchdown runs in the fourth (62 yards and six yards) to put YSU ahead 38-10. Samford had two touchdowns in the final seven minutes for the final margin. The Penguins had 289 yards rushing and five touchdowns as Webb led the way with 174 yards on 27 carries and two scores. The Penguins had five players named first-team All-Missouri Valley Football Conference while a total of 13 players were named all-league. Earning first-team honors were DE Derek Rivers, DE Avery Moss, TB Martin Ruiz, OG Brock Eisenhuth and FS LeRoy Alexander. Earning second-team All-MVFC honors were SS Jameel Smith, LB Armand Dellovade, OT Justin Spencer, P Mark Schuler and return specialist Darien Townsend. The Penguins who were named honorable-mention All-MVFC are OT Dylan Colucci, TB Jody Webb and CB Kenny Bishop. The five first-team picks were the most for the Penguins since 2006 when they had 10 first-team recipients. It is the third consecutive year that Rivers was named first-team All-MVFC. He is just the fourth player in YSU history to be named a three-time first-team all-league honoree. The other three Penguins to be named first-team all-league three times are Mychal Savage (2006, 2008 and 2009), James Terry (2005-07) and Dwyte Smiley (1997-99). Redshirt Freshman P Mark Schuler and sophomore C Vitas Hrynkiewicz were named to the MVFC All-Newcomer team. Schuler was a second-team All-MVFC pick in his first season as well. Hrynkiewicz has started all 12 games this year at center. Four of the five members of the offensive line earned league accolades of some kind this year. For the eighth time in his nine years as a collegiate head coach, Bo Pelini has coached a team to nine wins. In seven full seasons at Nebraska from 2008-14 he won at least nine games each year, including 10-win seasons in 2009, 2010 and 2012. Last year YSU was 5-6, but the year featured a two-point defeat, a pair of three-point losses that came in the final minute, an OT loss by a touchdown and an eight-point loss at Pittsburgh. The Penguins are appearing in the FCS playoffs for the 12th time in school history. One of the most successful FCS postseason programs, YSU is 26-7 all-time. The Guins have a .788 winning percentage, which is third all-time among FCS schools. YSU also ranks third in championships won (four) and championship-game appearances (six). Senior TB Martin Ruiz, a first-team All-MVFC pick, ranks second in career all-purpose yards and career rushing yards in YSU history. Ruiz has 4,239 yards rushing in his 47-game career. He had 78 yards on 15 carries in his FCS playoffs debut against Samford. In terms of all-purpose yards, Ruiz has 5,131 career yards also ranking him second in YSU history. A good effort against Jacksonville State could move him into first place in school history. Jamaine Cook owns the school record with 5,220 all-purpose yards. 1,094 as a freshman in 2013. For the third straight game and sixth time in his YSU career, Jody Webb amassed more than 200 all-purpose yards in a game when he had a career-best 276 against Samford. Webb's performance vs. the Bulldogs ranked fifth-most in a game in school history. His first five 200-yard games came against MVFC foes before a big game against Samford. Of note, five of his six have come in November. He had 214 on Nov. 12 against SIU and 240 at Missouri State on Nov. 19. In the final two regular season games last year he had 243 vs. Indiana State and 269 vs. NDSU. His other effort was 200 yards vs. Illinois State in 2015. The Penguins' defensive unit ranks highly in the FCS in numerous categories entering the Jacksonville State contest. YSU's defense has allowed just 16 touchdowns in the last 36 quarters. The Guins did not allow an offensive touchdown against Illinois State and UNI. The Penguins have allowed more than 25 points just once this season. That was 38 points in the second game of the season to Big 12 foe and nine-win West Virginia. The Guins have allowed 24 points in three contest as Samford, North Dakota State and South Dakota State all finished with that total. Six times this season the Penguins have allowed 14 or fewer points in a game. In two contests - South Dakota and Samford - YSU gave up a pair of touchdowns in each with the game in hand. The Penguins have rallied for fourth-quarter wins five times this season. YSU beat Illinois State 20-6 after trailing 6-3 in the fourth, the Penguins beat UNI 14-10 after trailing 10-0 in the final period, against Indiana State the Guins overcame a 10-6 deficit to win 13-10 and most recently YSU had the game-winning score with 4:59 left in a 14-14 tie with SIU. While the wins have been ones to remember, YSU has had three different quarterbacks play in the fourth quarters of those games. (Ricky Davis vs. Illinois State, Nathan Mays vs. UNI and Hunter Wells vs. Indiana State and SIU). A familiar face has started for the Penguins the past five games in junior QB Hunter Wells. Wells, who made his season debut on Oct. 29 against Indiana State, has had strong outings each of the past two weeks. He completed 14-of-15 passes for 147 yards and a touchdown while YSU scored 65 points at Missouri State. In the playoff win over Samford he completed 8-of-12 passes for 142 yards while the offense had 38 points, including 28 in the second half. He had a season-best 222 yards completing 18-of-27 passes at North Dakota State in his second start. He had two touchdown passes and was 13-of-25 for 124 yards vs. SIU. Last year he started all 11 games for YSU completing 159-of-291 passes for 1,975 yards and 13 touchdowns. In his YSU career, he has thrown for 4,483 yards and 30 touchdowns while completing 346-of-598 passes. YSU has registered 43 sacks on the season, one shy of the school record of 44 set in 1982 (11 games). Impressively 15 different players have at least one sack while eight have at least two. DE Derek Rivers leads the way with 11 sacks while fellow first-team all-league performer DE Avery Moss has 10. DT Savon Smith is third on the team with five sacks while DT Donald Mesier has three. LB Armand Dellovade, LB Jamar Pinnock, SS Jameel Smith and CB Kenny Bishop each have two. The combination of Moss, Rivers and Smith give the starting D-line 26 sacks. The YSU defense has surrendered just four rushing touchdown this year. The Penguins did not yield a rushing score for the first six contests before allowing a rushing touchdown in the first quarter at South Dakota State. NDSU had two rushing scores while Southern Illinois had one. YSU has allowed four rushing TDs in 48 quarters played. The Guins lead the FCS for fewest rushing touchdowns allowed this season. Last year, YSU allowed 20 rushing touchdowns, including 14 in the conference portion of the schedule. Sophomore LB Armand Dellovade, a second-team all-league selection, has continued to be a key figure for the Penguins. He leads the squad with a career-high 80 tackles and 56 solo stops. He is third with 9.5 TFLs, which includes a pair of sacks. In conference play he had 60 total tackles, highlighted by a career-high 11 stops against South Dakota State on Oct. 22. He has 39 solo tackles in MVFC play. Dellovade has had five-or-more tackles in each of the last 11 games. He came on strong as a true freshman finishing with 54 total tackles, including 32 solo stops. He started nine games as a true freshman. Senior SS Jameel Smith, a second-team All-MVFC selection, ranks second on the team with 68 total tackles, including 50 solo stops. This year, Smith also has two interceptions, four TFLs, two sacks, four pass breakups and three QB hurries to show off a well-rounded resume. In MVFC play, he had 44 total tackles, including 32 solos with sacks coming in the final two games against Southern Illinois and Missouri State. He has been strong as of late with 43 tackles in his last six games. Senior FS LeRoy Alexander is a two-time first-team All-MVFC selection. This year Alexander has 55 total tackles, including 39 solo stops, and has been the leader of a veteran secondary. Alexander has a team-high three interceptions. He had his best game of the season against Indiana State on Oct. 29 with 11 tackles, three TFLs and a pass breakup. Last year he was a first-team All-MVFC selection in his first season with the program after transferring from Nebraska. He was second on the team a year ago with 67 total tackles, 38 of which were solo stops. He showed his versatility in the YSU defensive scheme registering a pair of sacks to go along with a team-high four interceptions. He was also credited with 3.5 TFLs. 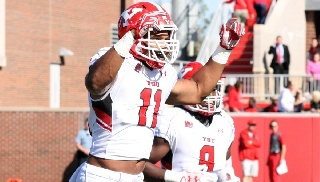 DE Avery Moss earned first-team all-conference honors in his second year and final year with the program. In the regular season, Moss had 42 total tackles, 28 of which are solo stops, and tied for the team lead with 10 sacks. He ranks fifth on the team in total tackles despite missing the Samford game with an ankle injury. Moss is also tied for the team lead with 12.5 TFLs while ranking first in forced fumbles. In MVFC play he had eight sacks with three coming against Indiana State and two at Illinois State. He has sacks in seven of the 11 games this year. Last year, Moss had 25 total tackles and 14 solo stops for the season. He had three sacks for the entire 2015 campaign. Sophomore TB Tevin McCaster has been a key part in the Penguins' backfield rotation. McCaster is YSU's second-leading scorer this season with seven touchdowns. He has rushing touchdowns in seven different games this year, and YSU is 6-1 in games when he scores, including the playoff win over Samford. TB Jody Webb has had the best three games of his season in the last three contests. Webb had not scored a touchdown in the first 10 games of the season and has four the past two weeks. Against Samford he had a career-high 27 carries for a career-best 174 yards. He also had a pair of touchdowns. Webb rushed for 166 yards and had two scores, his first of the year, at Missouri State. The week prior against Southern Illinois he had a career-best 167 yards rushing on 21 carries. Entering week 10 of the campaign, Webb had 320 yards on 75 carries. In the last three games he has 507 yards on 63 attempts. Of his 28 career touchdown runs, 17 have been of more than 20 yards. The Penguins boast one of the most experienced backfield tandems in the FCS in seniors Martin Ruiz and Jody Webb. Ruiz has played in 47 games and has rushed for 4,239 yards on 836 carries and scored 40 touchdowns. Webb has played in 43 contests, rushing for 2,764 yards on 411 attempts while scoring 28 touchdowns. Both runners rank in the top 16 in the FCS in active career yardage. Ruiz, who is fifth among active rushers, has rushed for at least 74 yards in a game on 34 occasions in 47 career games played. Senior DE Derek Rivers has had an impressive YSU career, but since the start of the 2014 season, Rivers has been one of the top defensive players in the FCS. Overall in his career, Rivers has 155 total tackles, 109 of which are solos. He has an impressive 51.5 TFLs, which rank him fourth in school history. This year he has 40 tackles, 34 of which solos, with 14.5 TFLs and 11 sacks. As a junior, he had 52 tackles, including an impressive 37 solo stops. He had 15.5 TFLs and nine sacks on the campaign as well. As a sophomore, Rivers was credited with 50 total tackles, including 17 TFLs and 14 sacks. In his last 35 games, he has 142 total tackles, 47 TFLs and 34 sacks. Rivers has had at least one sack in 19 of his last 28 games. Senior DE Derek Rivers is the school's all-time sack leader with 37. He is now YSU's career record holder by 15 sacks. On Oct. 17, 2015, following a two-sack performance against South Dakota State, Rivers eclipsed the school mark of 22 which had been held by Jermaine Hopkins since 1995. Hopkins played for the Penguins from 1992-95, and his career sack totals include postseason contests. Impressively, it took Rivers just 28 games to break the 20-year-old record. The Penguins' defensive-end combo of Avery Moss (No. 9) and Derek Rivers (No. 11) is one of the top ones in the nation. WVU Head Coach Dana Holgorsen was quoted as saying following the contest "These two cats that we played against from Youngstown State were as good of pass rushers as I've seen" (h/t @mitchsherman). Rivers has a team-high 11 sacks and 16 quarterback hurries while Moss has 10 sacks and eight QB hurries. It marks the third time in school history that YSU has two players with 10-or-more sacks in the same season. Redshirt freshman P Mark Schuler has had a strong start to his career. Schuler, a second-team All-MVFC honoree this year, leads all freshman FCS punters and ranks eighth overall averaging 43.5 yards per kick. He has 13 punts of 50 yards or longer and has placed 22 inside the 20-yard line. The school record for average in a season belongs to Nick Liste who averaged 44.2 yards in 2013. The freshman mark is also held by Liste, an average of 41.4 yards in 2010. Schuler had a career-long boot of 74 yards in the first quarter against Samford last week. He also has a 62-yard punt (Indiana State) and a 61-yarder (Southern Illinois) to his credit this year. Sophomore PK Zak Kennedy is 12-of-18 on field-goal attempts and 27-of-27 on PAT tries. He has excelled at kickoffs with 21 touchbacks in 35 attempts. Last year he had four touchbacks in 29 kickoffs. As a squad last year, YSU kickoff specialists had just nine touchbacks. He did not play in the final two games of the season. He set the school record with 19 field goals in 2015. Kennedy was a first-team All-Missouri Valley Football Conference honoree in his first year. He was the first freshman PK since UNI's Scott Obermeier in 1992 to be tabbed first team. In his career, he has made field goals in 19 games and attempted kicks in 20 of 21 contests. • Turnover Margin: Since 1996, the Penguins are 128-33 when they win or tie in the turnover margin. When committing more turnovers, YSU is just 24-61. • 129-16 when rushing for 200-plus yards. • 151-25 when scoring 28-or-more points. • 182-15 when leading entering the fourth. • YSU has scored points in 103 straight games. The winner of the YSU-Jacksonville State contest will play the winner of The Citadel-Wofford game in the quarterfinals.